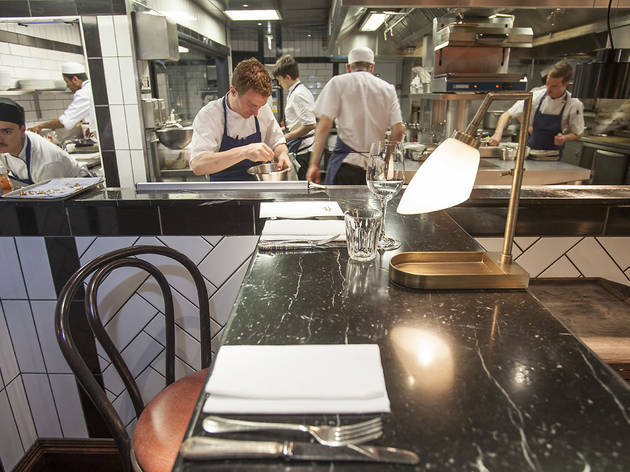 Under the gifted guidance of Paul Hood, one of Jason Atheron's talented team, imaginative modern cooking from a kitchen brigade at the top of its game. It’s not easy to open a spate of brand-new restaurants and maintain high standards, but chef-patron Jason Atherton has clearly moved on from being the sorcerer’s apprentice (under Gordon Ramsay) to being the sorcerer himself. His Little Social deluxe bistro only opened in March 2013, right opposite his fine dining Pollen Street Social in Mayfair. He followed this up, weeks later, with an even more ambitious restaurant in Soho, by delegating the chef role to his buddy and long-time head chef at Pollen Street Social, Paul Hood. The ground-floor dining room has a mirrored ceiling to create the sensation of space in a low room; upstairs is a smart cocktail bar, called the Blind Pig, which also has a separate entrance. Most of the action is in the dining room, though, with a kitchen brigade who are clearly at the top of their game. 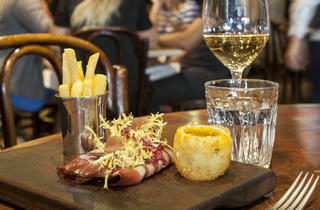 Smoked duck ‘ham’, egg and chips is a dish that’s typical of Pollen Street Social’s playfulness. 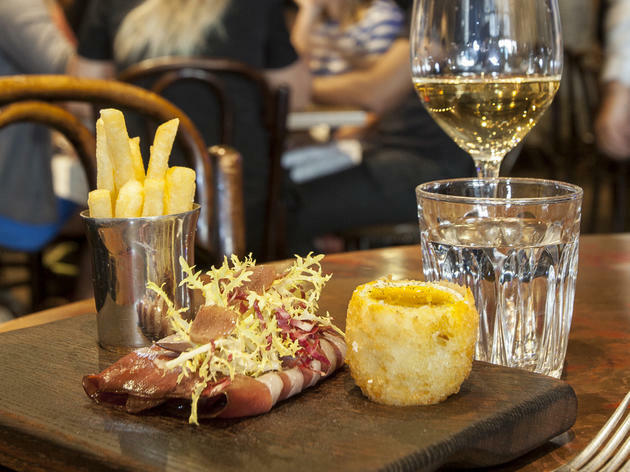 ‘Ham’ is cured and smoked from duck breast on the premises, served with a breadcrumbed duck egg that’s molten in the middle, but with an aroma of truffle oil. Umami – savouriness, the taste that enhances other flavours – was also plentiful in a roast cod main course that uses powdered Japanese kombu seaweed in a glaze, served with a creamy sauce of roasted cockles and just-in-season St George’s mushrooms. Presentation is a strong point of Hood’s dishes, just as they are for his mentor Atherton. A starter of ‘CLT’ – crab meat, a fan of blonde castelfranco radicchio leaf, and heritage tomatoes, which had been blanched to remove the skin, was given a further umami hit with a roast tomato vinaigrette. The desserts also showed inventiveness, imagination and attention to detail. A honey almond sponge, inspired by the version at Pollen Street Social, was nicely paired with a scoop of goat’s curd ice cream. On our visit the service was sweet and eager, and the dishes arrived fast. If you visit the basement (where the duck smoker as well as the loos are housed), this will give you a chance to look straight through the glass-walled private dining room towards the kitchen, which is in full view of the ‘chef’s table’. On our visit, chef Paul Hood and his team were working their magic with a spell-like calm. Gone are the days of shouty chefs as role models; the quiet achievers who play nicely and play together are currently coming out on top. The ‘Social Eating House’ does stay true to its name: it is not only located on one of the most well-frequented streets in Soho (Poland street), surrounded by bars of all interests, but it really is a place for socializing. Not necessarily with the fellow diners (who seem to be in the mid-30s and up age categories) but with the waiters and sommelier and the other “supervisors” who carefully stroll around the tables, asking you how your special cognac cocktail or lamb neck fillet is. It makes me you feel cosy and looked-after, which is a rarity in today’s fancy and poshy-posh restaurants. We shared two jars of salted cod and duck rilliettes and thought that serving such small starters in “grandma’s” jam jars was a funny invention. Something special to start with. Then we took the lamb neck fillet which was meltingly tender and had a perfectly tasty sauce with it. The risotto could have had more twist (or just a pinch of something exotic! ), but it went down very well nevertheless. The other main dish we ventured was the cod with the chestnuts, cabbage, and bacon and some incredible sauce. We almost wished we could have had just simple spaghetti with a casserole-quantity of this sauce! The cod was of course very fresh and smooth. There was no space for desserts so we decided on continuing with the drinks and ended up having 6 cocktails. After a slight disappointment of not finding a cognac-based cocktail on the menu, the sommelier reminded us that the bartenders are happy to present us with any known or imaginary cocktail we would like. So we ended up having the Japanese cocktail and a refreshing Singapore sling at the end. Overall we would highly recommend the Social Eating House. It is worth trying for its cosy but not over-trendy atmosphere, for the excellent food quality, and of course for those divine cocktails that make you forget that your dinner that started with a full jar ended with several empty cocktail glasses! Good spot for nibbles and yummy cocktails. Recently visited Social Eating House for the Saturday lunch time menu. The food was fantastic and will definitely be coming back. The set three course menu was great value at £26 per head. After three such good courses it is hard to pick a favourite and while the the saddleback pork was delicious, for me it had to be desert. The coconut crème brûlée was amazing and the portion was a lot bigger than I was expecting. The restaurant has an extensive wine list with a large variety, which although not cheap, should cater for all paletes. I recently went to the Social Eating House for a pre theatre dinner, which was reasonably priced at £33.50 for three courses and a cocktail. If you don't go for the pre theatre menu however, the bill will me much larger with most mains costing £28. The restaurant is almost hidden away on Poland Street with an "optometrist" sign hanging outside... I'm not sure what that's about. Inside, the restaurant is beautifully decorated with a dark wooden bar at the front and sumptuous booths around the room. The dining room has a surprisingly large capacity and there's even a bar around the kitchen in the basement for people wanting to eat at the chef's table. The starter and main I had were absolutely delicious. I had tomatoes and burrata to start and macaroni and cheese with mushrooms as a main. I would happily have both of those again. The only blip in the meal was my dessert which was a "grue de cacao" with a foamed yogurt which was so sour it made my face pucker. The service was very friendly and our server came over at least five times to refill our water. We went for dinner at 6:00, before the theatre, and were out by about 7:10. There is the excellent Blind Pig cocktail bar upstairs too if you have time before or after your meal. Social Eating House has been my favourite restaurant for years now. It really is one of London food scene's greats (to confirm it, the place was as heaving on a June Monday evening when I went there last as if it was a weekend night). The design is great and well maintained and the place hasn't aged a bit since the day it opened quite some years back. If you have time before dinner, stop for a drink at their upstairs bar The Blind Pig. The menu always features the best of seasonal British produce (there's a separate menu page listing where each ingredient has travelled from to reach your plate). But they are smart to keep a few of their best dishes on the menu at all times - nice anchors for the regulars to come back to. In my case such anchor would be mushrooms and toast: mushrooms are served in a separate steam pouch and it's the loveliest of experiences when that pouch is put in front of you to release all that aroma. Beware: the portions are substantial here. In most cases I am happy skipping the main course and going for 2 starters instead. And the one time I went for a tasting menu I actually regretted it... because it was way too much (I know, it's weird making it sound almost like a negative thing). Out of the 6 courses at least 3 are definitely full size portions. Both I and my partner could barely touch courses 4 through 6, we were so full. On the other hand, their tasting menu may well be the best tasting menu deal you'll get in London (priced at £65 a head for 6 courses). The food is of consistently superior quality and they are definitely not skimping on the expensive ingredients (lots of black truffle went onto both my eggs and Jerusalem artichokes and gnocchi). My recommendation is to skip the wine pairing, though (I found some of the wines to be too out there for an average palate). The venue does seem a bit like an exclusive secret society. Everything on the menu was intriguing and I wanted to order each dish to try. We asked for some recommendations and the waiter seemed to know enough about the dishes. The ham hock jar was surprisingly good and delicious with the piccalilli. Roasted loin of rabbit and black treacle cured cote de porc (pork chop sounds so much more fancier in French). Each dish was packed with flavour and I devoured every single thing on my plate. Dessert of clementine parfait and caramelised milk and brown sugar tart were just as good. Wheelchair access: step free entrance and there is plenty of room to get around without having to ask other diners to move out of the way. There is also an accessible toilet within easy reach. Service was good and food amazing. This is one of the few places where I want to try everything on the menu so will definitely be back for more. 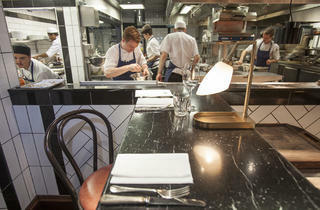 I am a big fan of Jason Atherton's and have visited a number of his restaurants but I have to say this is my favourite. The food is amazing and the staff are friendly and accommodating. 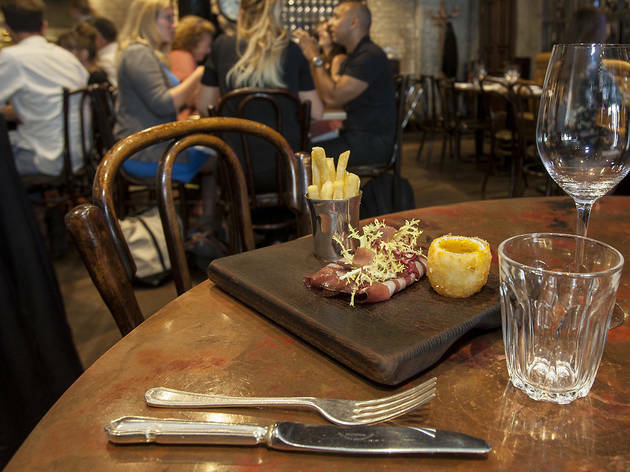 Perfect for a catch up with friends for lunch or dinner. I went for lunch recently and I would say we overstayed our welcome (but there was no pressure for us to leave the table and the service was impeccable) as our meal went into cocktails and then it was evening... so we ended in the bar upstairs, The Blind Pig which is very cool and you are served by the hipster types! The espresso martinis are to die for and I've tried a few at different bars. All the cocktail choices are great and something to meet all tastes. So that's a lot about the drinks but the food is also amazing and I love the sharing starter jars, perfect if like me you like a little of everything! Looking forward to my next visit already. Quite an intimate restaurant - at circa £60 per head for a main course lunch with a couple of glasses of fizz and coffee) we were hoping it would be good, and indeed it was. Not absolutely top drawer, but the service was spot on and the food was excellent. This was my first experience of a Jason Atherton restaurant & I wasn't disappointed. The food was absolutely exquisite. It totally surpassed the menu's depiction. It was good value too being a set menu. The staff were friendly & the atmosphere was relaxed. A modern gem in Soho. As a bit of an Atherton groupie, this is my favourite of his London establishments. I had the privilege of being on the chefs table recently and to see the level of complexity, precision and care that goes into every plate is quite remarkable. My only learning is to not go with fussy eaters the intricate and often usual flavours are not to everyones taste. Superb Jason Atherton establishment with a great buzzy atmosphere. The mushrooms-in-truffle-oil-in-a-bag starter is one of the best starters I've had in a long time followed by the Romney Marsh slighly salted lamb, washed down with a fantastic, relatively low priced Bulgarian Sauvigon is a killer combo. The food is so good that the bill can start to rack up quite quickly. If you go prepared to spend at £150 for two people you'll have a great time. It's a restaurant for a great occasion that you've just got to try out...as with all Atherton establishments. Great restaurant. Really recommend for business or social. Highlights for me - the mushrooms in a bag and the duck and egg and chips starter. Me an my wife went for a late, long lunch. We couldn't have been more impressed. 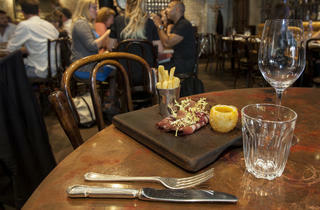 The atmosphere was busy an buzzy yet more then enough space to have a private and intimate lunch. Service had high standards but was relaxed - all the little touches you would expect from top notch service but delivered in a relaxed, fluid style. The food? To die for. My wife had the excellent value lunch menu - hake and a risotto dish which was subtle yet so flavoursome. I opted for the rib-eye. The duck fat chips actually ADDED to the flavour of this exquisite steak - cooked to perfection with a fresh salad and stunning bernaise. This was, bar none, the best steak I had in my life. Dessert was again excellent. My deconstructed lemon meringue pie was a proper pudding!! Refined, each element stood out and, what often is missed on high quality establishments.... a dam decent portion! My wifes' plum tart again was excellent and she enjoyed her cheese board. On top of not being judged for ordering a pink drink (I like pink lemonade OK!?) we thoroughly enjoyed our meal at the Social Eating House. The food is great, but might be a bit overpriced for what it actually is. You seem to pay for the ambiance as well. It was a bit noisy, I could not hardly speak with my company without shouting. My second experience of Jason Atherton's restaurants is almost as good as the first one :D what a pleasant surprise. This is a more casual, affordable a place for a quick lunch than somewhere like Pollen Street Social, and fits in very nicely with the vibe of the local area. I'm now addicted to the bar upstairs, where you can get really quirky, playful drinks that are superbly well-made for under a tenner... a pretty mean feat nowadays. Even their Probiotic is probably the nicest non-alcoholic cocktail I've ever had, which is saying something for a boozehound like myself. Similarly, the winelist, while a lot smaller than the one at PSS, seems to follow a similar pattern of cherry-picking unusual wines at modest prices. On my last visit, I had a particularly good Austrian wine called Theodora that was probably the most interesting white I've tried all year (and I drink a fair amount being a sommelier). But yes, onto the food :) a little more bistro-style than Atherton's other offerings, this is more about comfort food than fine dining. The little jars we had to start were excellent, the pork rilletes pretty much textbook, except for the little twist of mini onion rings dotted on top. After that, my girlfriend and I both had the wild boar raviolo, which was amazing... rich and herby wild boar ragu, with a garlicky tomato sauce base and meltingly soft pasta, with a little pepper grinder filled with dehydrated pig heart and kidneys on the side to add a touch of gentle offal flavour. I'd be surprised if that doesn't make Time Out's Top 10 dishes this year. For the maincourse, I had the cote du porc, basically a good-sized porkchop with perfect smoky caramelisation from the grill on the outside, amazingly tender on the inside, which came with a wonderful white polenta (or grits, as Americans call them). Very good indeed. My lady opted to go for a lighter dish in the Monkfish, which was served unusually with an Asian-spiced chicken jus. Despite the cognitive dissonance I had at trying to reconcile fish and poultry in my mind together, it was a perfect pairing, the aromatic and savoury flavours of the sauce bringing out the inherent meatiness of the fish. The roasted courgette it sat on was lovely too. For pudding, we decided to share a Strawberry Mojito Sundae, which tasted exactly as it sounds. Very refreshing, and made me wish most bars could summon a drink that good in liquid form, let alone as a sundae. So, all in all, a fabulous meal, far more affordable than I expected, paired with some of the best wine I've found in central London yet. I am a new, self-proclaimed foodie, I have been to over 40 restaurants in the last 2 months to catch up to my more knowledgeable colleagues in the field. This is right at the very top of my list. Put aside the charming decor, brilliant service and experimental cocktail list for a second. The food... ugh... the food is outstanding. I had the lamb neck fillet for main and it was just perfect, not very heavy, full of taste. I asked the waiter to remove the parsley spread but he seriously recommended keeping it even after insisting I didn't like green foods, he was absolutely right. This restaurant is an absolute MUST. Really cool place with amazing food. The ambiance is just great. Start with a drink upstairs and finish by an amazing dinner downstairs. You will be surprised by the quality of their food! This was very much 'all that' - one of the most memorable and impressive meals I've had in a long time. Being delicious is one thing, but distinctive is quite another and our meal had both - though the starter (had to go with the duck, smoked ham, eggs and chips mentioned in the review) , cocktail and dessert shone far more than the fish dish we had for main. We arrived at 7.30 on a Thurs not expecting there to be room, but they found space at the Chef's Table downstairs, mentioned in the review, which I'm sure was far more fun than the normal restaurant would have been. A very special meal indeed! Dreadful!! The only good thing about Social Eating House is the bar and even that is not great - faux-hipsters serving stupidly small cocktails in a near-empty bar (7.30pm on a Thursday). Resturant really wasn't up to scratch - lots of staff but not one person seemed to be able to look after us. The first waiter to take my wine order had a black eye (nice!) and couldn't tell the difference between a house wine and the Pollen Street blend. Food was OK but certainly not worth the price tag - only one rather lame vegetarian main course option that I could easily have made at home (Mac n' Cheese, hardly breaking any boundaries). The biggest tell-tale sign was a half-filled dinnng room with people taking photos of their food, annoying. Don't waste your time, try Claude's - a million times better, both in terms of quality of staff, food, atmosphere and price.